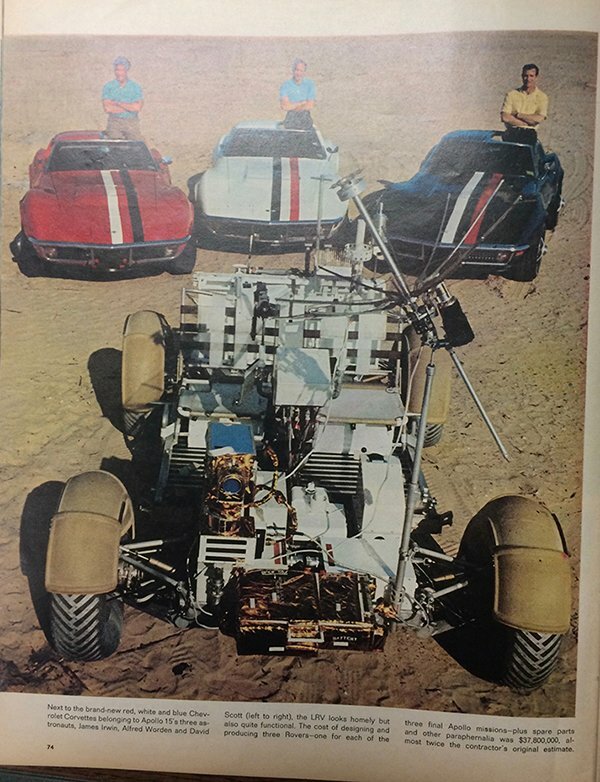 The Corvette hobby is a sub-culture of the larger car-culture. 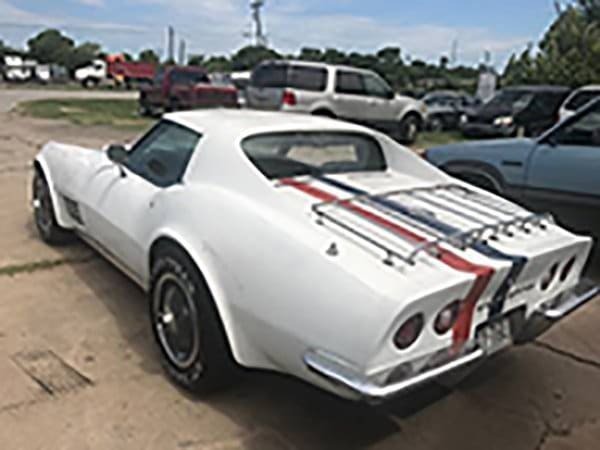 Within the Corvette community, there are many sub-cultures where owners do different kinds of things with their Corvettes. Some race their Corvettes and within the racer crowd, there are different kinds of racing. 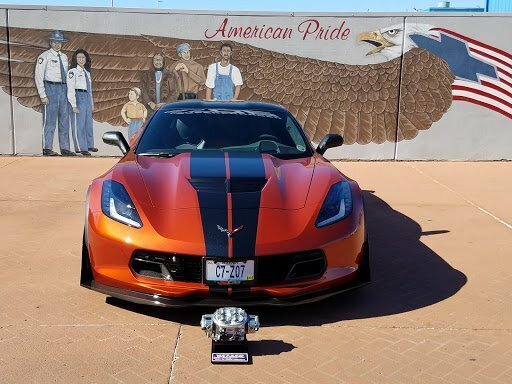 Some start out personalizing their Vette that leads to all-out custom Corvettes. 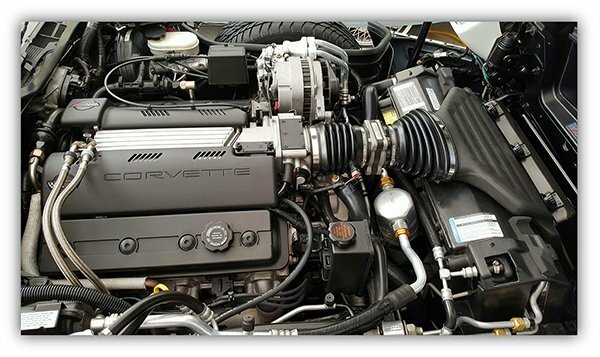 Others give their Corvette a pampered life with heated and air-conditioned garages; the cars never get wet and are cleaned after every drive. On the opposite side are the Vettes that are driven, repaired, and enjoyed for hundreds or thousands of miles. At the extreme opposite end of the daily drivers are the Vette Vues Tri-Power, NCRS Top Flight, Bloomington Gold, and Triple Diamond Award Corvettes. 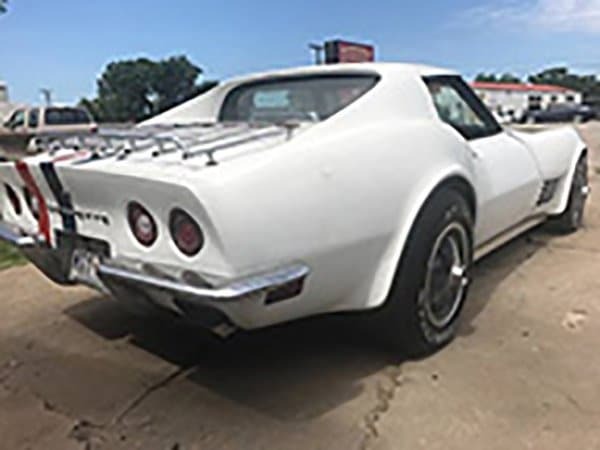 These Corvettes look like they were put into a Star Trek transported and beamed from Bowling Green or St. Louis, directly to the owner’s garage. For Corvette fans that haven’t been to the Bowling Green Assembly Plant and taken the tour, these Corvettes are as close as you can get to “factory fresh.” What every Corvette nitch has in common (besides a passion for Vettes) is that the owners are all enjoying their Corvette in their own unique way. Ed Nieves was like lots of red-blooded American males that have a “Someday I’ll get a Vette!” mental infection. But life and obligations typically keep the Corvette daydreams way down the list. Ed had the itch we can all relate to. But in 2008 he decided to go for it! 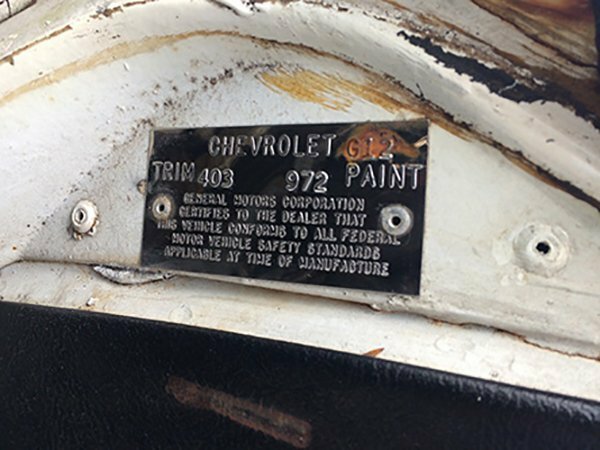 Ed’s “dream Vette” was white with a red interior – just like the first 300 1953 Corvettes. 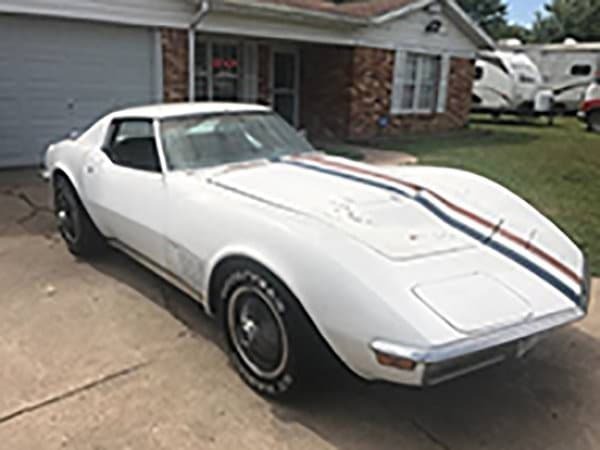 He was willing to go for a C3 Corvette but found very few with the white/red combo he wanted. Ed was hoping to find a private seller, looking for a new home for his baby. 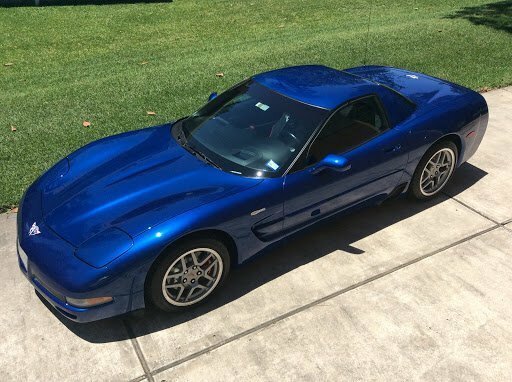 As luck would have it, Ed found a 1995 Corvette, with the color combo he wanted, and it was only one hour from where he lives in Miami, Florida. 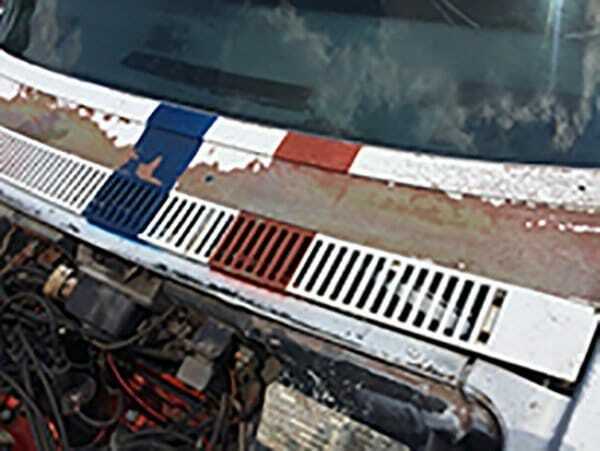 But here’s the big, “But…” The car was up for auction on eBay, which was not how Ed wanted to buy his Corvette. However, the description was intriguing; it read . . . 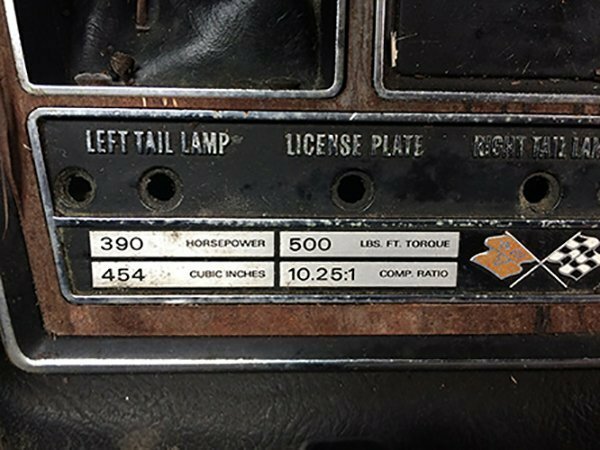 The listing said that the 13-year-old Corvette only had 14,000 miles – very light usage. 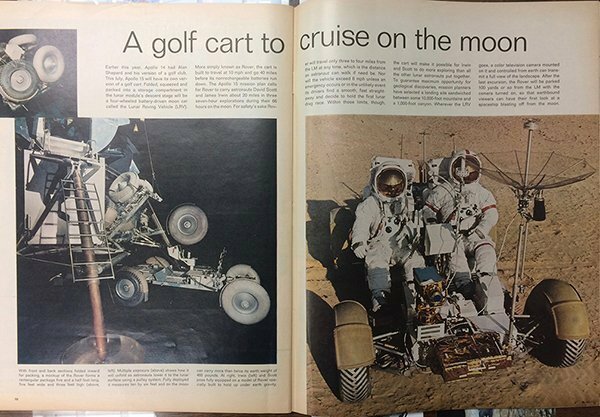 The more Ed looked at the photos and read the car’s details, the more he knew he had to act quickly. If that’s the color combo you’ve always wanted, and the details were right, who wouldn’t want to check that out if it was only one hour away? 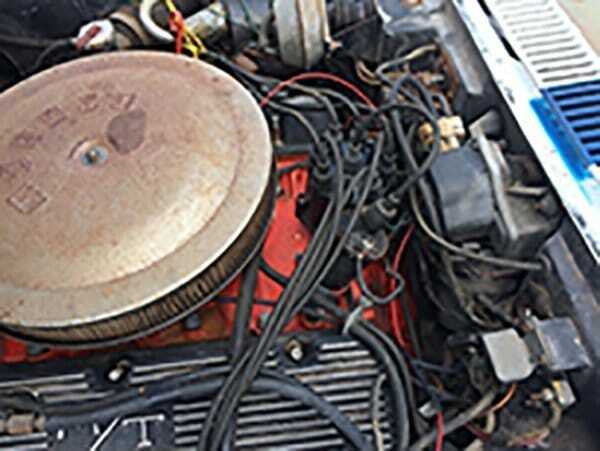 Ed contacted the seller in Fort Lauderdale and arranged to see the car. Upon his arrival, within seconds, Ed knew this was the real deal – exactly the Corvette he wanted! The deal was quickly negotiated, and an hour later, Ed had the top down and was heading south to Miami. 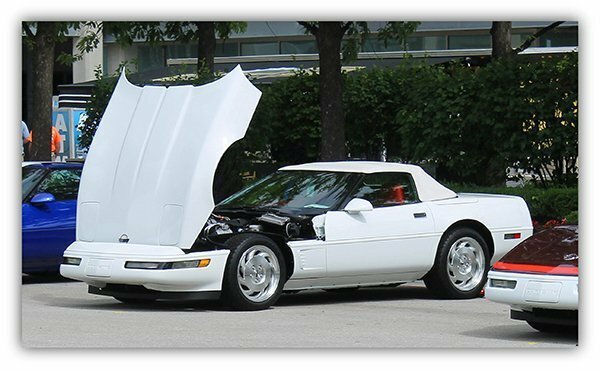 After Ed had the oil and fluids changed and a good tune-up, he drove and enjoyed his white 1996 Corvette convertible, mostly on the weekends. South Florida is a wonderful place for top-down evening cruising. Things cool off, the air is sweet, and the sunsets are spectacular. 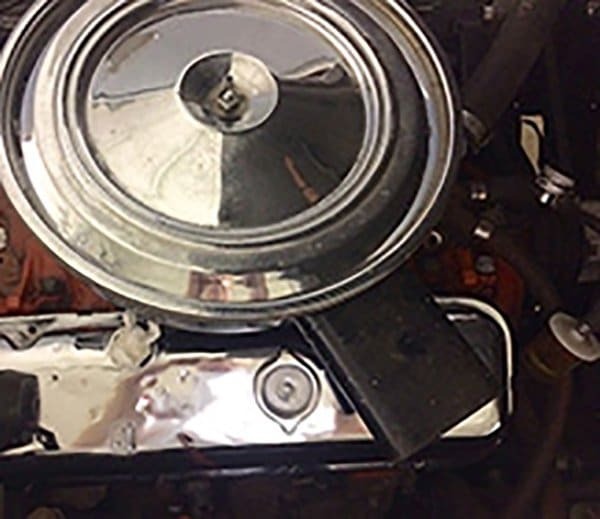 The car wasn’t “perfect” and needed a few things, but it was all small stuff. Ed was a happy guy. The Sunshine Corvette Club is a Miami-based Corvette club. When Ed decided to attend the club’s Annual Corvette Show, he really didn’t know what to expect. 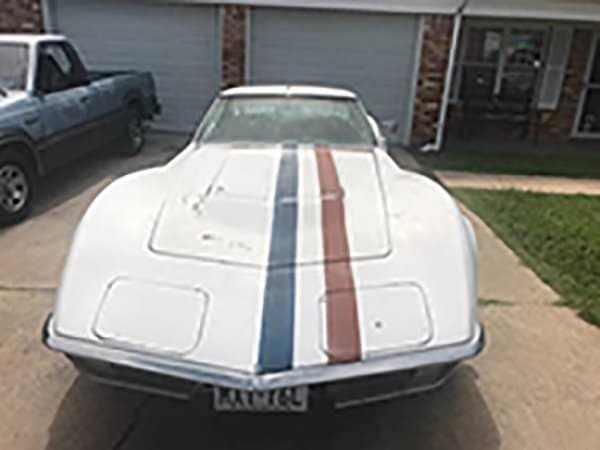 What he found was a great group of Corvette lovers, eager to help one another. Ed also got an experiential education on super-sano Corvettes. Much to Ed’s surprise, his Corvette was awarded 3rd Place in the C4 class. Seeing what the 1st place Class winners looked like, Ed got a clear picture of what he needed to do to get his Corvette up to speed. 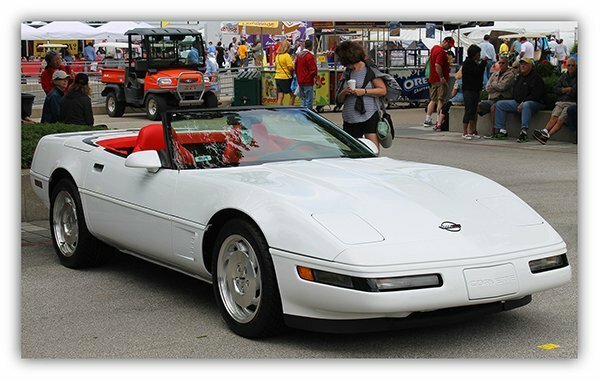 Ed joined the Sunshine Corvette Club in Miami and show his 1995 at the annual Corvette show and won 3rd place! 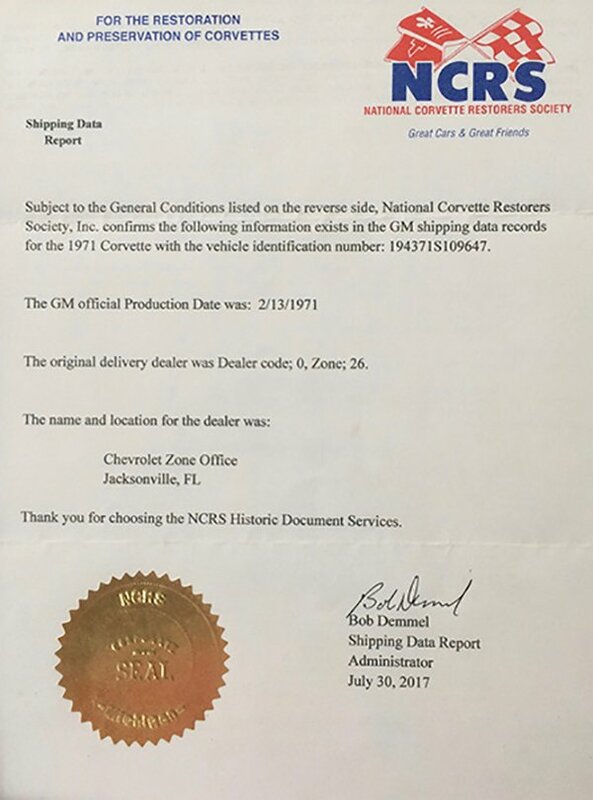 Ed’s Corvette pal, Jack Exter, told him about the National Corvette Restorers Society (NCRS), and that the NCSR Florida Winter Regional Meet in Kissimmee, Florida and was to be held in January 2012. 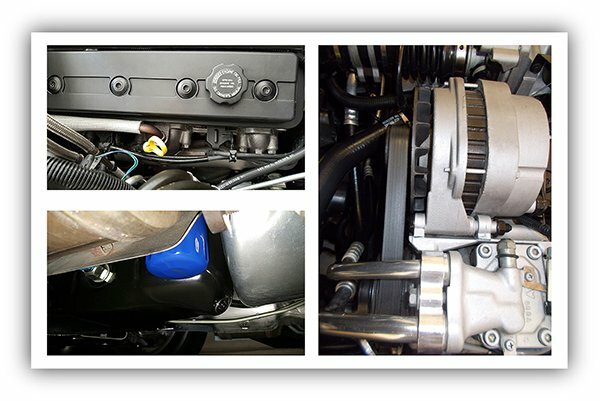 In the five years from 2012 to 2017 Ed has racked up an impressive number of awards, including; Four Top Flights, an NCRS Performance Verification Award (which requires every component of the car to work to factory specifications), and an NCRS Hill Mark of Excellence Award (reportedly, only 34 cars have won this NCRS prestigious award). Four Top Flights, an NCRS Performance Verification Award (which requires every component of the car to work to factory specifications), and an NCRS Hill Mark of Excellence Award (reportedly, only 34 cars have won this NCRS prestigious award). 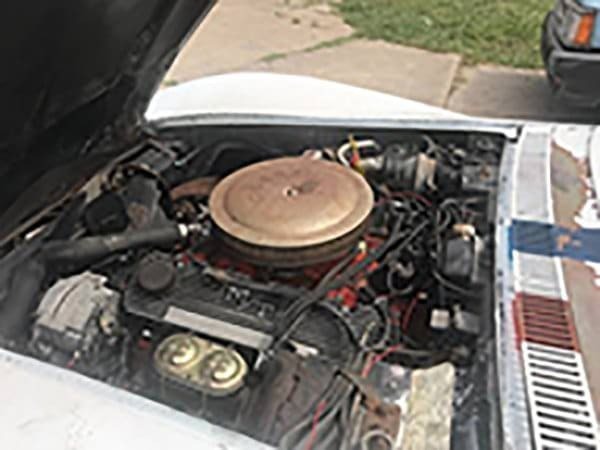 Ed set his sights on two very special national awards; the Vette Vues Tri-Power Award (hosted at the Corvette/Chevy Expo, in Galveston, Texas) and the MCACN Triple Diamond Award (hosted at the Muscle Car and Corvette Nationals in Chicago). 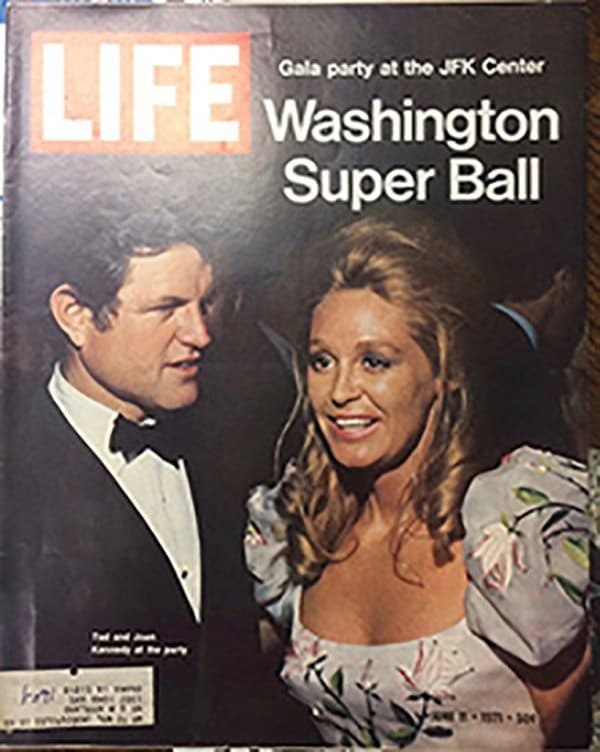 But, Ed learned that he needed to first have a Bloomington Gold Award in order to qualify for the Tri-Power Award and the Triple Diamond Award. Ed gets a trailer to go to the shows with. 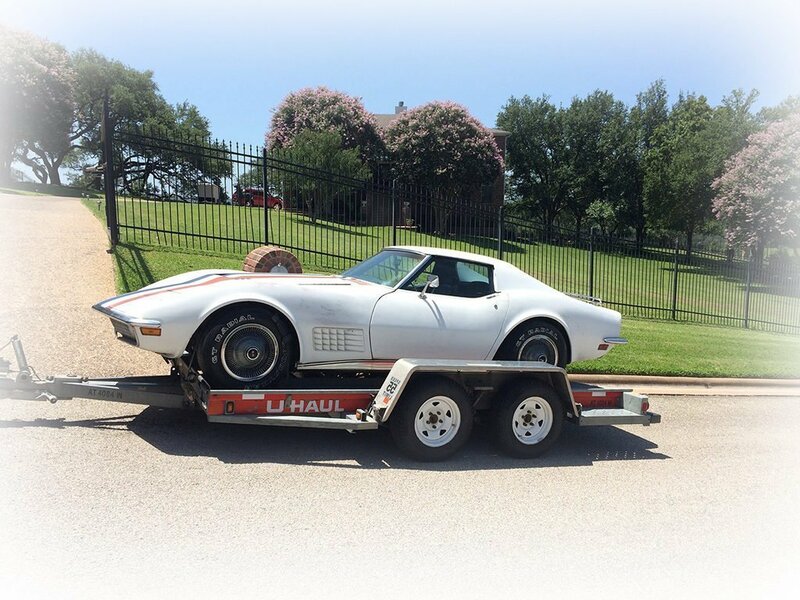 By this time, Ed was a veteran at transporting his Corvette in an enclosed trailer. 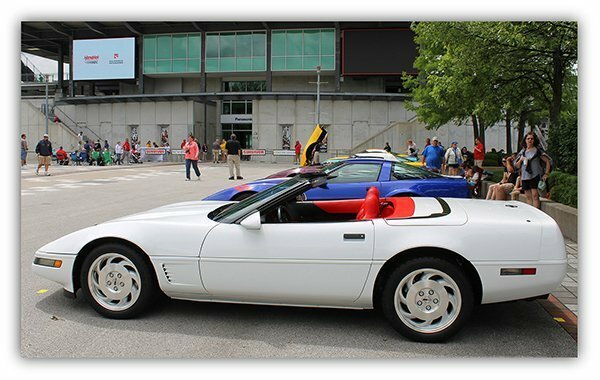 In 2015 Ed packed up his 1995 Corvette and headed to Indianapolis. The event was spectacular for Ed, as his Corvette scored 99.5 out of 100, and received a Bloomington Gold Award. Ed, as his Corvette scored 99.5 out of 100, and received a Bloomington Gold Award. 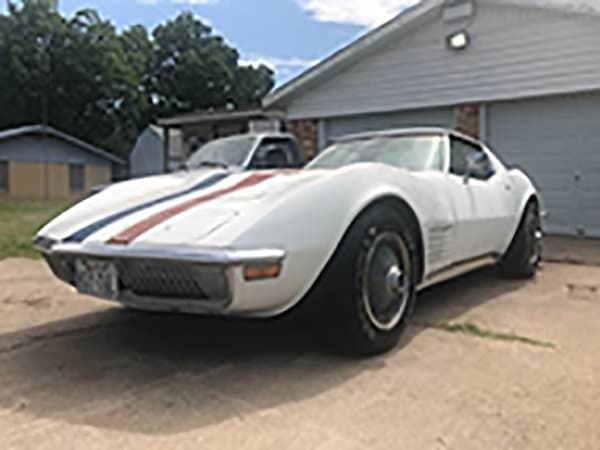 With a Bloomington Gold Award under his belt, in March 2017 Ed sent in his application for the Tri-Power Award to Bill Wolf, publisher of Vette Vues Magazine and organizer of the Corvette Chevy Expo in Galveston, Texas. 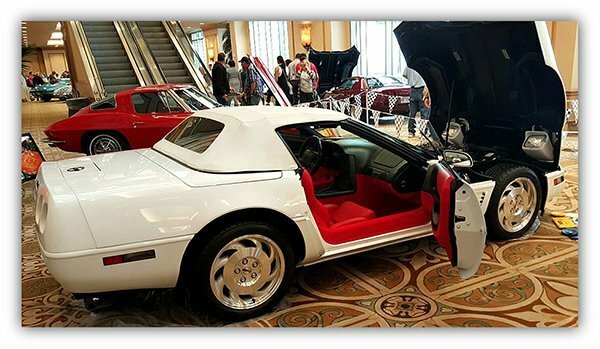 Ed’s 1995 Corvette was one of the featured Corvettes in the lobby at the Corvette Chevy Expo in Galveston, Texas. Ed received a Tri-Power Award, a President’s Award (awarded to cars that score above 98%) and won Best of Class. 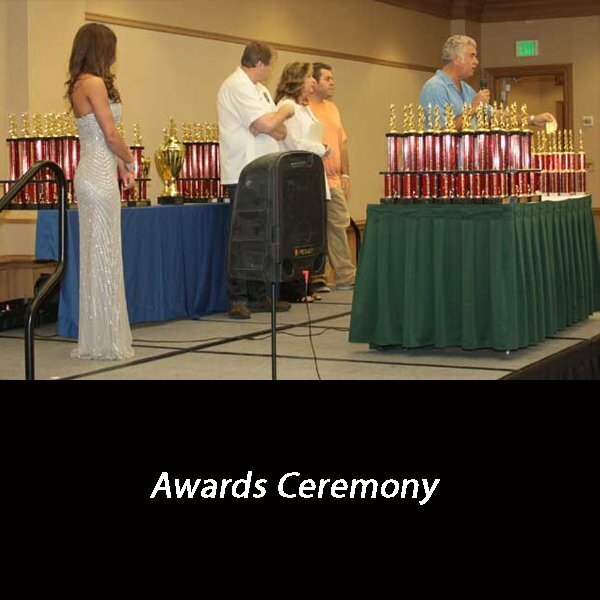 In November 2017 it was time to go for the Triple Diamond Award at the MCACN (Muscle Car and Corvette Nationals) event. 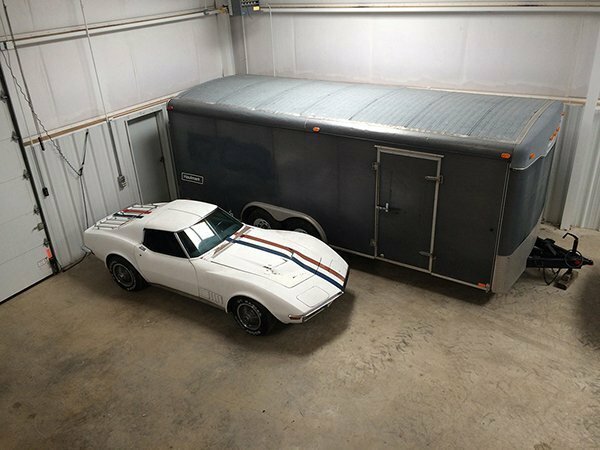 Ed packed up his award-winning 1995 Corvette and headed north for the LONG 1,400 miles trip from Miami, Florida to Rosemont, Illinois. This is the biggest and toughest muscle car and Corvette show of the year, and there were approximately 570 pristine cars there. 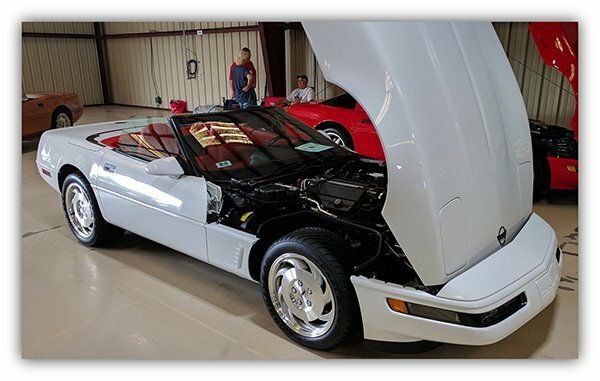 Ed packed up his award-winning 1995 Corvette and headed north for the LONG 1,400 miles trip from Miami, Florida to Rosemont, Illinois. After the judging, Ed’s car received very positive feedback and at the awards ceremony was awarded the MCACN’s Triple Diamond AND Gold Concours Awards! Ed’s 1995 Corvette convertible scored in the high 99-percent range. 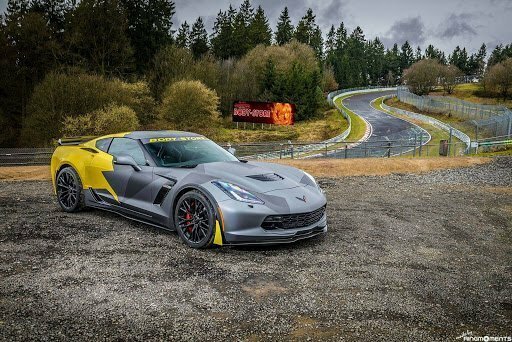 When thinking about “competition” Corvettes, we usually think “racing.” But this is a very different kind of competition; it’s about extreme attention to details. 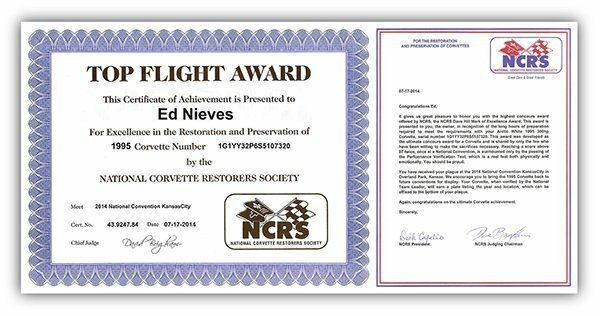 Ed’s Corvette went from being a well-kept driver to an NCRS Top Flight, Tri-Power, Bloomington Gold, and Triple Diamond award-winning car. This kind of competition isn’t “just” about having a well-preserved automobile. Ed’s Corvette also has the complete owner’s manual, delivery inspection brochure, Chevrolet Satisfaction System Brochure, Corvette Roadside Assistance Brochure, GM Warranty booklet, the Limited Warranty brochure, the CFS brochure, the locking nut bag, two sets of keys, key knockouts, the emergency key from the factory, the original air filter, and the passive keyless entry decal. 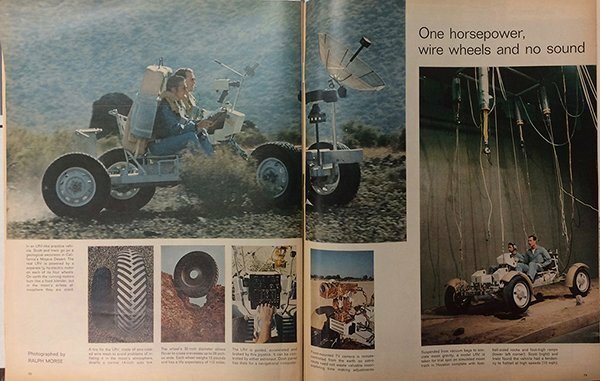 The only thing missing is the original gasoline, oil, coolant, and air in the tires! 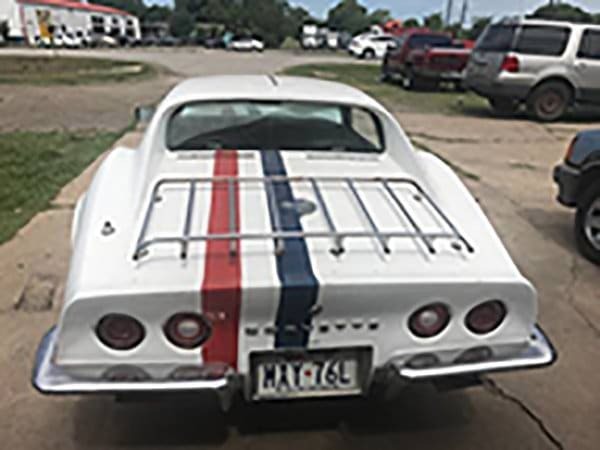 Obviously a Corvette such as Ed Nieves’ doesn’t rack up many, if any, miles on the road anymore. Maybe Ed will have to look for a second white and red Corvette driver. If he does, will he be able to keep it a driver, or will the temptation be too great to turn it into another award-winning Corvette? Keep us up to date Ed. Al Knoch Interiors Onsite Installs on Corvettes! Al Knoch Interiors does onsite installs at the Corvette Chevy Expo in Galveston Island, Texas (just south of Houston). 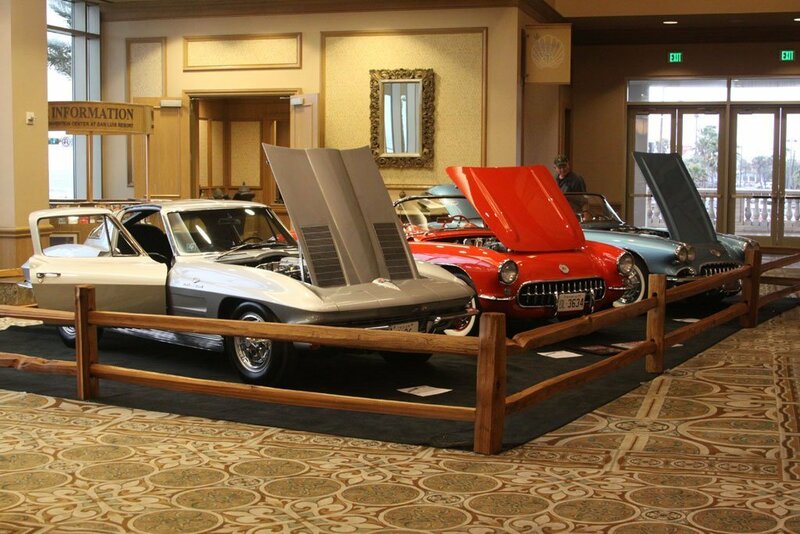 We are gearing up for the 40th Corvette Chevy Expo. Al Knoch Interiors does installs at the Corvette Chevy Expo in Galveston Island, Texas (just south of Houston). They can only do so many, so call them to reserve your spot 1.800.880.8080. 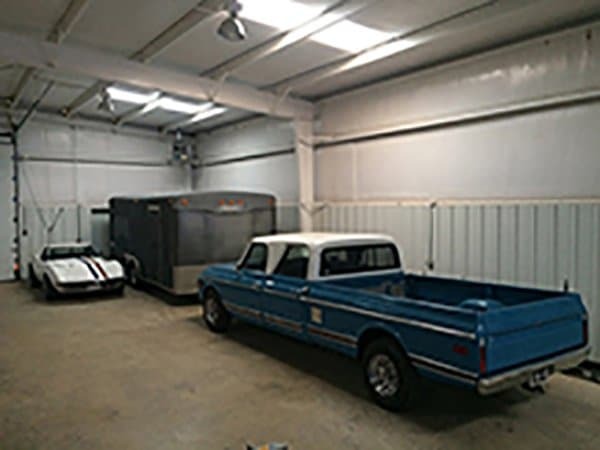 They can install door panels, convertible tops, and more. 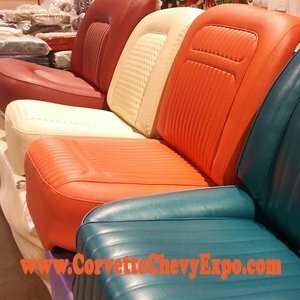 To learn more about the Corvette Chevy Expo visit our website: https://corvettechevyexpo.com/ Al Knoch Interiors Onsite Installs at the Corvette Chevy Expo. 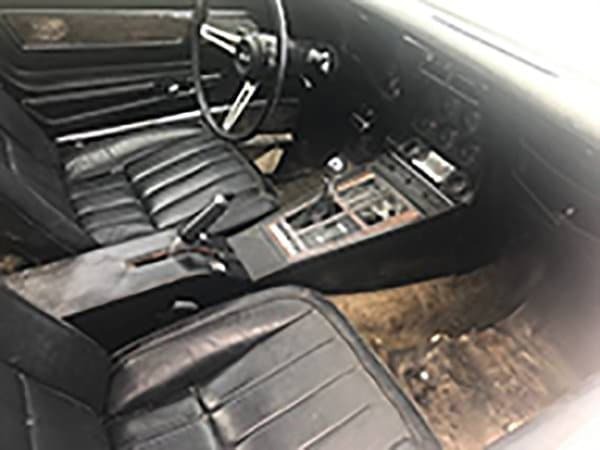 Al Knoch Interiors manufactures interior products with exact interior reproduction quality for interior antique auto installations. 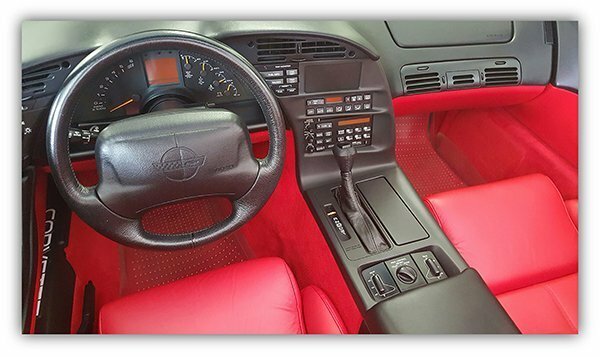 Al Knoch Interiors provide original Corvette restoration interior parts. 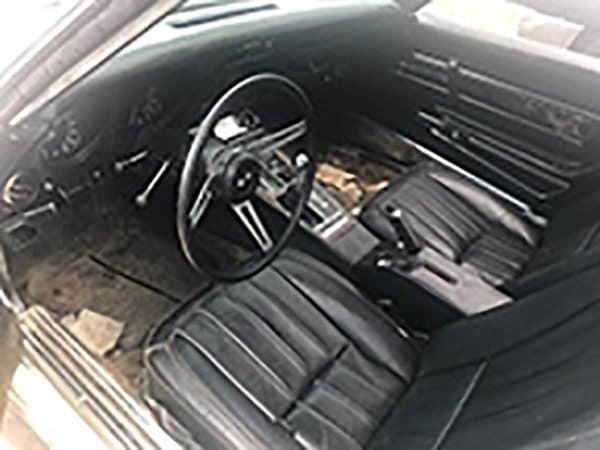 Best classic Corvette interior products, non-original custom interior parts. Are in interested in being a Show Car at the Next Corvette Chevy Expo. 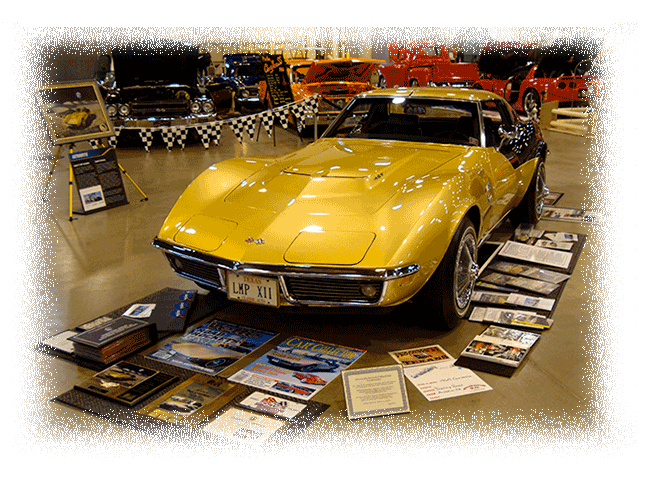 Check out our Corvette Show Car information page. Here is the link for the Registration Form. Do you have a Bloomington Gold Certification and an NCRS Top Flight? 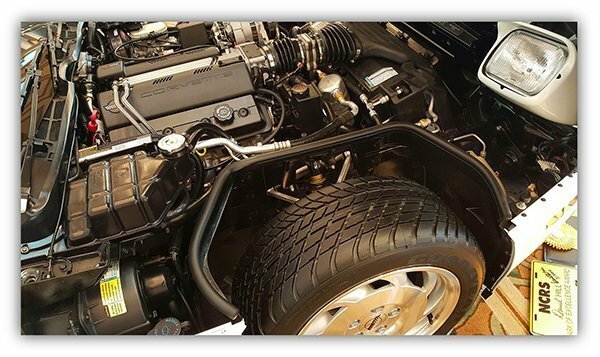 Learn about the Vette Vues Magazine Tri-Power ® Award. You might enjoy reading the coverage of the last year’s event in Vette Vues Magazine. 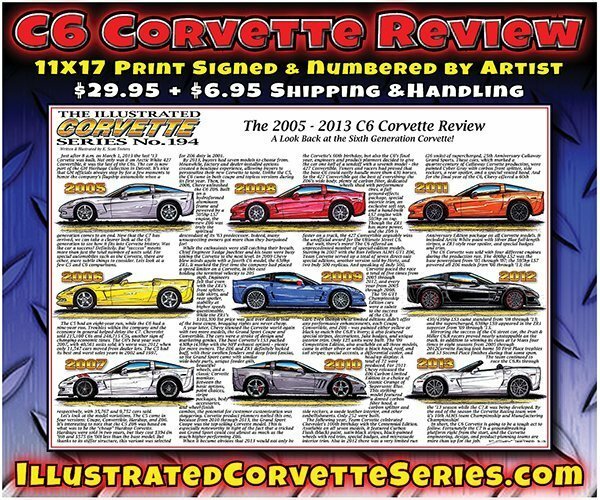 If you have never seen Vette Vues Magazine you can signup for a Free Corvette Magazine Sample copy. 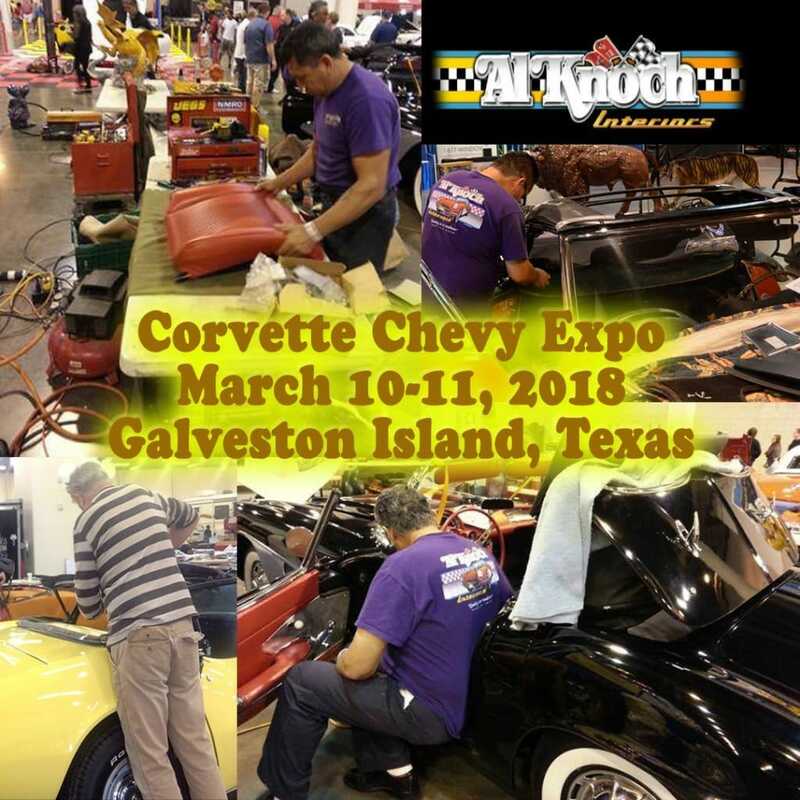 The Corvette Chevy Expo will celebrate its 40th anniversary when it returns to the Galveston Island Convention Center March 10-11, 2018. 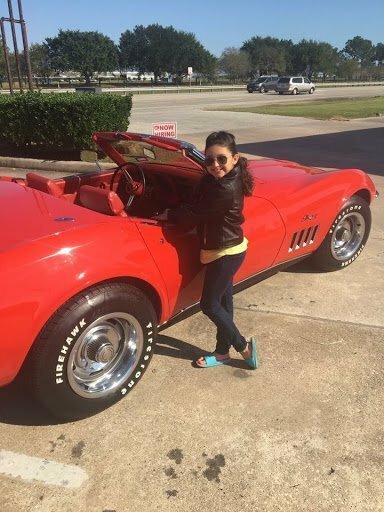 Punta Gorda, FL – June 1, 2017 — The Corvette Chevy Expo will celebrate its 40th anniversary when it returns to the Galveston Island Convention Center March 10-11, 2018. The Expo is produced by Vette Vues Magazine, Inc. 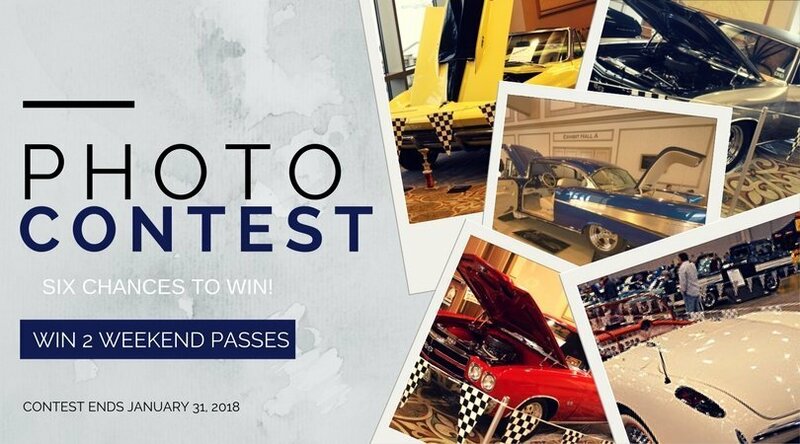 The All Chevy-themed event held annually at the GICC, is one of the south’s greatest Corvette & Chevy shows, attracting spectators from Texas as well as surrounding states. 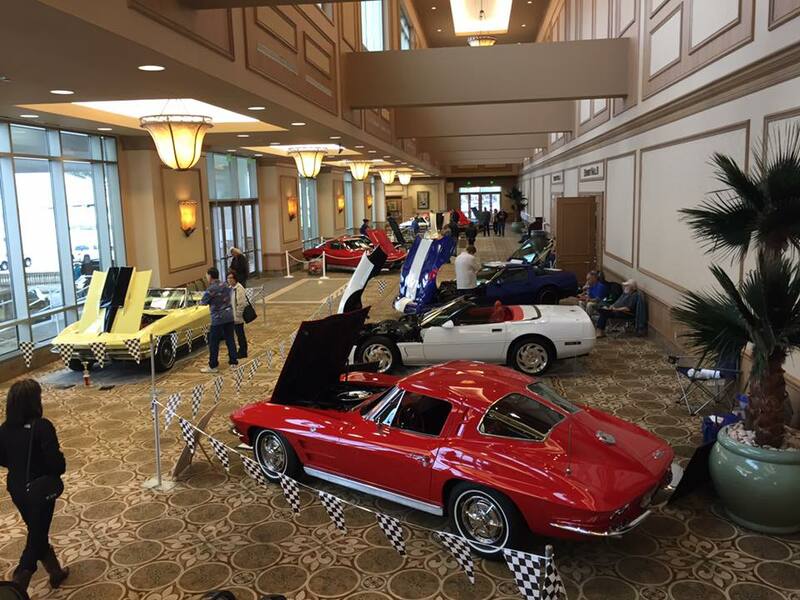 Located on Galveston’s famous Seawall Boulevard, the Galveston Island Convention Center at the San Luis Resort is the perfect destination for a weekend of Corvette and Chevy fun. The Corvette Chevy Expo rents the entire first floor equaling 83,800 square feet. As you enter the 29,000 square foot pre-function space you see World Class Chevrolet Show Cars beautifully display with the breathtaking views of the Gulf of Mexico. 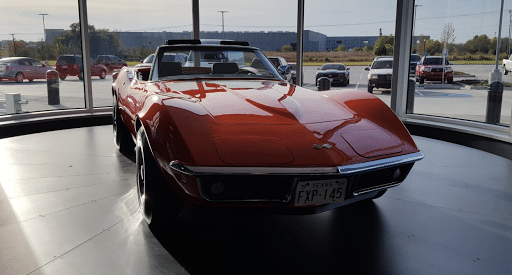 The 43,100-square-foot main exhibition hall also is full of show cars, cars for sale, as well as Major National Corvette and Chevy Vendors from across the country. Overflow vendors are in the 5,100 sq ft. Galleon room along with the food court and stage. 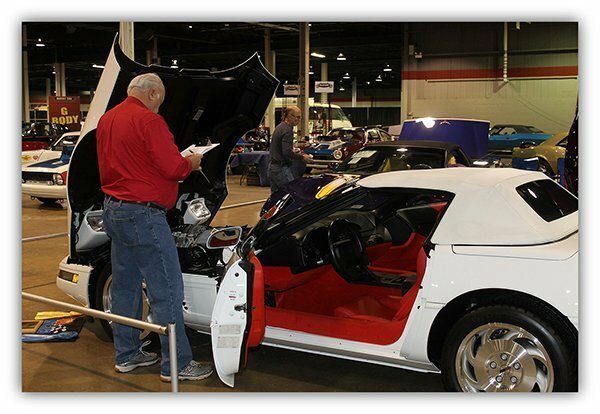 In 2016, the Corvette Chevy Expo introduced the new Craft show. This encompasses 6,600 sq ft of handmade items from the local region. Kathi Richardson, from the local Corvette Club, heads up the new Show’n Shine Car Show in front of the Galveston Island Convention Center. There are two shows, one on Saturday and one on Sunday, each with the own set of awards. Sunday, Vette Vues Magazine does its photo shoot for their Racy Vues column followed by Swimsuit USA International’s swimsuit contest. There is plenty of available free parking in the adjacent parking garage. Discount tickets are available before the event on www.CorvetteChevyExpo. 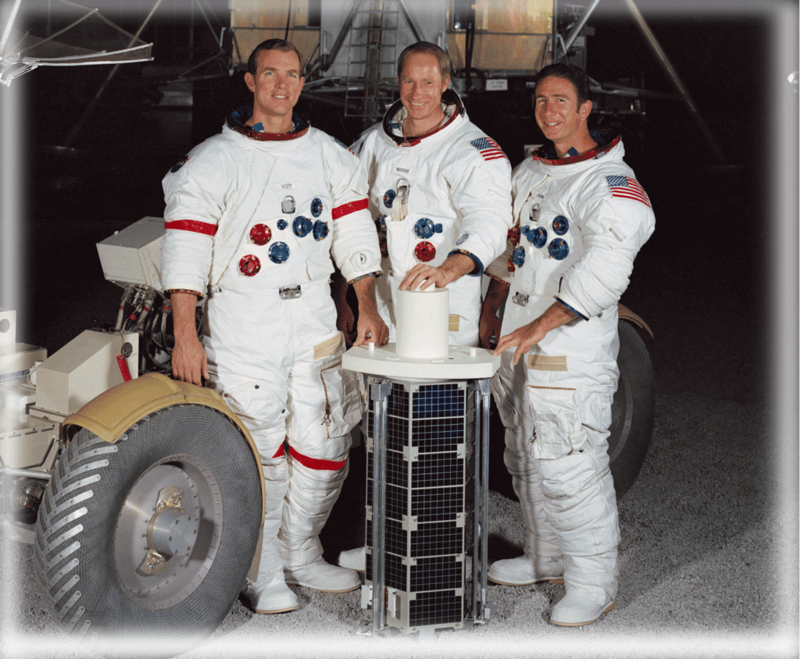 For more information, please visit www.CorvetteChevyExpo of call the office 386-775-2512. 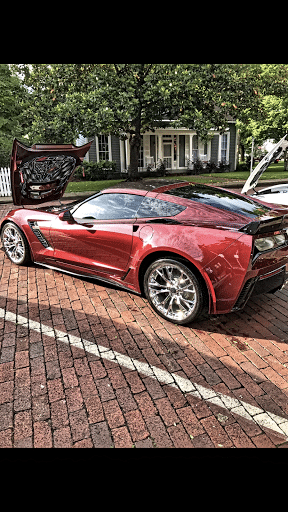 The 39th Corvette Chevy Expo rolled through Galveston Island March 11 – 12, 2017. Here is the list of the 2017 Corvette Chevy Expo Award Winners.